She was known in South Africa as the ‘Mother of the Nation’ . She spent the majority of her life campaigning against apartheid – the violent white rule of the South African government between the 1940s and the 1990s that led to extreme segregation and discrimination against black South Africans. Her efforts did not go unpunished, and she was frequently incarcerated and banished during the fight for her people. But her legacy is not without bruises. Her name is intertwined with atrocities such as murder, kidnapping and corruption. She was married to Nelson Mandela, an icon of South African liberation, but the public implosion of that marriage, too, left her reputation marred. This is the complicated and powerful story of Winnie Madikizela-Mandela who died today, aged 81. Winnie was born in 1936, the fourth of eight children to teacher parents. Her mother died when she was nine, and she and her siblings were scattered to live with different relatives. Winnie worked to become Head Girl at her high school and went on to study social work at the The Jan H. Hofmeyr School in Johannesburg – the school opened in 1941 and was the first institution to train black social workers in South Africa. “There is an anger that wakes up in you when you are a child,” she wrote in her 1984 autobiography, Part of my Soul Went With Him. 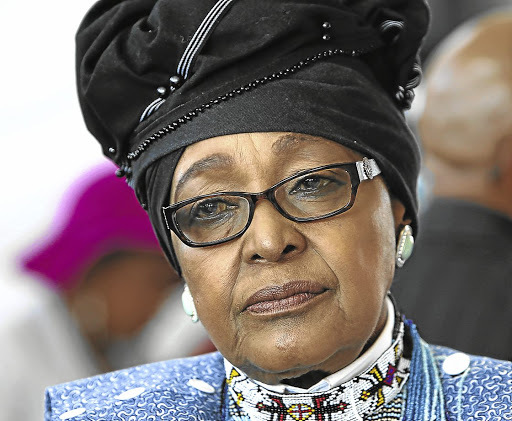 Soon after her graduation in 1956, Winnie was 22 and standing at a bus stop in the Johannesburg suburb of Soweto when Nelson Mandela saw her, The Guardian reports. Mandela asked Winnie to lunch the following week and that is how their life together started and continued: Mandela would send a car to pick up Winnie, they would meet, and then he would have to leave. “Even at that stage, a life with him was a life without him,” her autobiography reads. For their first date, the pair ate at an Indian restaurant, The Washington Post reports, and she – at 23, as she would for the rest of her life – hated the spiciness of the chilli. Sixteen years her senior, Mandela took her walking through the countryside and asked her to work for him, to help raise funds. They were married for 38 years and have two children together – their daughters, Zenani and Zindziwa. Even at the time of their bus stop meeting, Mandela, working for the African National Congress (ANC), was one of the most recognisable black political figures in South Africa. His name first became prominent after a 1952 rally in which he led a crowd of 10,000 in protesting the peaceful defense campaign against apartheid, the book Mandela: A Critical Life by Tom Lodge explains. He was arrested for his efforts, but held fast to his beliefs that a peaceful approach would not do. Later, in 1995 after an unsuccessful protest attempting to stop the forced relocation of all black people from a suburb in Johannesburg, Mandela officially declared violent action would be necessary in the fight against apartheid and he appealed to China for weapons. He was unsuccessful but he did not give up. He led protests, even though the government frequently arrested him and banned him from speaking. He travelled around the country, secretly organising workers strikes. He held interviews with journalists and became the leader of a militant guerrilla group. He was constantly in hiding from the government and, despite Winnie’s conviction that “politicians are not lovers”, the pair became each other’s anchors in times of immense stress and uncertainty. In 1963, Mandela was sentenced to life imprisonment after he was found guilty of sabotage and conspiracy to violently overthrow the government in the Rivonia trial. Winnie was hardly ever permitted to see him, but she continued her fight to free the South African people from white supremacy. For 27 years, in betweeen being imprisoned and banished herself, she and their daughters visited Mandela when they could. Always separated by a sheet of glass. Finally, on February 11, 1990, Winnie was there at Mandela’s side as he was freed from prison after 27 years, The Guardian reports. He had been starved and often kept in solitary confinement. His eyes were permanently damaged from the hard labour he was forced to endure without sunglasses. But that moment, as he walked from the prison, Winnie at his side, was the moment the world knew apartheid was over. Still, Winnie’s path was not without controversy. She was regularly imprisoned and tortured by the South African government herself for protesting and speaking out against the regime. In 1969, she was forced to spend 18 months in solitary confinement, The Washington Post reports. She was interrogated non-stop for days and forced to sit upright constantly, until her body was swollen and she passed out. Still, she continued. She approached journalists to raise awareness and she worked to fortify her community, opening day care centres and teaching women how to farm sustainably. But, as the war escalated, so too did the questionability of her tactics. There were reports of Winnie misusing international donations for social welfare programs. She started drinking heavily, The Washington Post reports and became involved in several extramarital affairs. In 1986, she started the Mandela United Football Club, which came to be known as her ‘gang’. There were whispers of murders and abductions circling her name. In April of the same year, Winnie led a rally in which she called for the “necklacing” of police officials – a practice that involves covering a tyre with gasoline, throwing it over a victim’s head, and setting it alight. “We have no guns — we have only stones, boxes of matches and petrol,” she said, The Washington Post reports. Later, in 1998, a South African Truth and Reconciliation Commission labelled the Mandela United Football Club “a private vigilante unit” that had showed no regard for human rights. It concluded: “The Commission finds that those who opposed Ms. Madikizela-Mandela and the Mandela United Football Club, or dissented from them, were branded as informers and killed. The worst of it, perhaps, came with the abduction and murder of 14-year-old James Moeketsi Seipei, or “Stompie” in 1988. Stompie and three other kids were taken from their home at a minister’s house. They were abducted by the coach of the Mandela United Football Club, Jerry Musivuzi Richardson, and Winnie claimed it was because she believed the priest was sexually abusing the teens. All four were beaten, Winnie said, to see if they’d confess to sexual relations with the reverend. But Stompie was also accused of being an informer to the government and, on the night of January 1, 1989, he was taken from Winnie’s house – after being tortured – and he was killed. His body was found in a field six days later, with stab wounds to the throat. “The three survivors – Kenneth Kgase, 30, Barend Thabiso Mono, 20, and Gabriel Pelo Mekgwe, 21 – testified that Mrs. Mandela was the first to beat them, using her fists and a whip,” reads a 1990 report from The New York Times, after Richardson was found guilty of murder. “My wife’s whole reputation is being smashed without her having the opportunity to reply,” Mandela, who was out of prison by this time, told The Times. Winnie was also charged for Stompie’s murder. And, though she was convicted of kidnapping in 1993, she never went to jail and was forced only to pay a fine. In 1992, Mandela filed for divorce because of Winnie’s infidelity. Though she wanted to remain married, the judge approved the separation. “[I embrace my wife] with all the love and affection I have nursed for her inside and outside prison from the moment I first met her,” Mandela said at the time, The New York Times reports. He wasn’t so kind, later, telling reporters “I was the loneliest man during the time I stayed with her,” The Washington Post reports. Winnie kept campaigning and, even though the fight against aparteid was over, she remained in politics working for the ANC. She was found guilty in 2003 of fraud – which ended her political career – but she continued fighting for the rights of women, and the poor, in South African communities. She never lived like other politicians, in the fenced-off mansions in the opulent suburbs of Johannesburg. She lived with the people she fought for, her people. And, though her name will be forever tied to that of Nelson Mandela, she left her own legacy, too. “I am not Mandela’s product,” she told an interviewer, The New York Times reports. And there is no better quote to encapsulate Winnie’s complicated, powerful past. A story of passion, determination and a fierce love for her people that has, today, come to an end. Editor’s note: This story appeared first on Mama Mia and was penned by Caitlin Bishop.